Rain, rain, go away -- don't come back until we are done riding day!!! The storms clouds are all over the Baltimore/Washington,DC area and with no sign of relief for several days. The thought of riding through rush hour traffic being splashed by every vehicle with the wind in your face and the rain pelting down was not a good image to wake to. There was definite mixed feelings among the group. Maxwell has returned so he for sure wanted to ride -- of course, Jan did and Peg was up for trying it. Mark was to be the sweep anyway, so he "suited up". Nancy was to drive the sag, but the way the route was laid out for the day, there would be little to no place where the van and the group would actually meet, so her plan was to just drive to the next hotel. Idea: Let's let Nancy ride with her husband today and Frankie and Sue can move the van to the next place!!! Seemed like a reasonable plan. Everyone who wanted to ride could and Frankie and Sue would stay dry!!! The Washington area is actually very biker friendly. Many people who work within the DC limits and live outside either commute by way of the Metro or ride their bikes in. Thus there are many bike trails that keep the rider away from the highways and traffic. The motel in Rockville was not directly on a trail, but with some investigation a route was discovered that got one to it with only a little "rush hour" hassle. 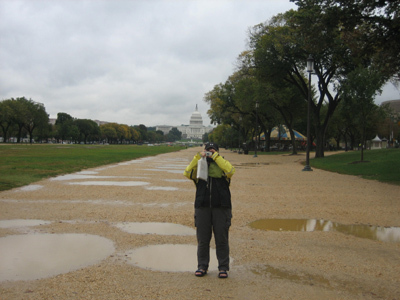 Dressed in layers and plenty of rain gear, the five "rain riders" left Rockville with the hope of getting to DC in enough time to sightsee before continuing on to Alexandria. The van left by way of the expressway and with the great GPS system barking out orders of when to turn and which lane to be in arrived at the next "home" with little to no difficulty. 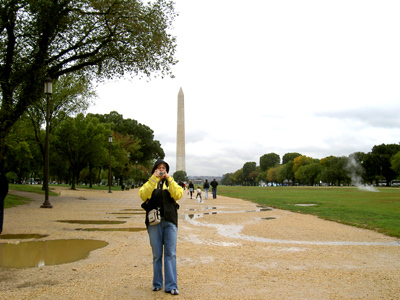 After parking in the ramp and registering at the desk it was off to the Metro and a day in DC in the rain. 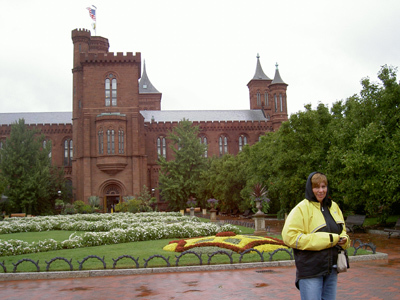 Frankie and Sue visited the Holocaust Museum, the Smithsonian, and the National Gallery of Art before returning in the evening to Alexandria for dinner and sleep! Tomorrow is a rest day, so chores can wait. Frankie Taking a Picture of Sue Taking a Picture! Sue Taking a Picture of Frankie Taking a Picture!